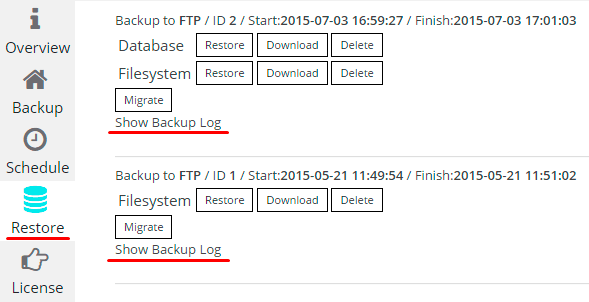 ﻿ How to Create Backup with Backup Plugin by Supsystic? After you have selected the storage and have specified all the settings, click Start Backup. Wait while your site is being backed up. It can take a while if your website is large. It depends on your site and hosting how much time will take the process. While plugin is backing up your website, you are not able to create another backup. When you see the message “Backup complete”, you can check the folder with backup. There you should see the archive with backup, log file and .sql file (sql file will be created only if you set the database backup). All this files will be with the same ID in the name. On Restore tab will appear a new entry with Database (if you marked Full Backup or Database Backup) and Filesystem backup files. 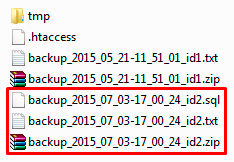 On top will be shown where has been made backup, the ID of backup files, the date and time of the backup. You can restore, download (only if it was backup to FTP server) or delete backup, simply click on the appropriate button. Also here you can view the log file of backup – just clicking Show Backup Log. You can also see the event log during backup creation by clicking on Show Log on the progress bar.